Brassinosteroids have been found in a broad spectrum of microalgae, their biological activities correspond to the function in higher plants. Studies on the endogenous brassinosteroids suggest that the operation of the early and late C6-oxidation pathways, lead to brassinolide existence in algae. The growth and development of algae under the influence of brassinosteroids are unusually dynamic, despite the application of micromolar concentrations. These compounds regulate every aspect of algal life, from formation during development via stimulation of metabolite synthesis to abiotic stress responses, such as heavy metal action, salt and thermal stress. The relationship between brassinosteroids and the other well-known plant hormones has been explored. 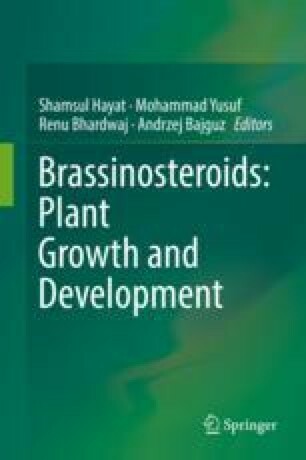 This chapter summarizes the studies of brassinosteroids on algal cultures in the last three decades. Author is grateful to Adam Bajguz for an excellent assisting during the text edition in LaTeX. Choudhary, S. P., Yu, J. Q., Yamaguchi-Shinozaki, K., Shinozaki, K., & Tran, L. S. P. (2012). Benefits of brassinosteroid crosstalk. Trends in Plant Science, 17, 594–605. https://doi.org/10.1016/j.tplants.2012.05.012. Tran, L. S. P., & Pal, S. (eds) (2014). Phytohormones: A window to metabolism. Signaling and biotechnological applications. New York: Springer. https://doi.org/10.1007/978-1-4939-0491-4.